This post was submitted by Jeremy, one of our PorschePerfect.com readers. He decided to take a little field trip to a local “Porsche” vendor and share what he found there. Thanks Jeremy! A few weeks ago I was reading the LA Times business section and came across a cool article about a SoCal couple who transformed their passion for Porsches into a multi million dollar business. Much to my delight, I discovered the close proximity of their business to my house. I had to drop in and pay them a visit. I was so impressed by what I saw at ‘L.A. Dismantler’ that I wanted to share it with this community. Nestled at the bottom of the La Tuna Canyon in Sun Valley, CA is a strip of salvage yards for just about every car on the road. The luminary of these establishments, by far, is the one that specializes in the Porsche brand. Formerly known as L.A. Porsche, L.A. Dismantler was started by husband and wife team Todd and Sara Dakarmen back in 1995. Todd’s love affair with the Porsche brand began at the age of 16, when he first became a Porsche owner (lucky dog). With nearly every member of his family being a Porsche driver, it’s as if Todd was born with the brand in his genes. In the early 90′s, Todd was running KAOS, a Honda and Accura salvage yard in Los Angeles where he began dismantling Porsche as a hobby. He, like so many of our members on this page, has a fantastic spouse who convinced him to start a business that focused exclusively on Porsches. Todd and Sara started ‘LA Porsche’ out of their home and 15 years later ‘LA Dismantler Inc.’ has a growing staff of 17+ and a sales volume of $5 million to $10 million a year and are now one of the largest Porsche only salvage facilities in the world. 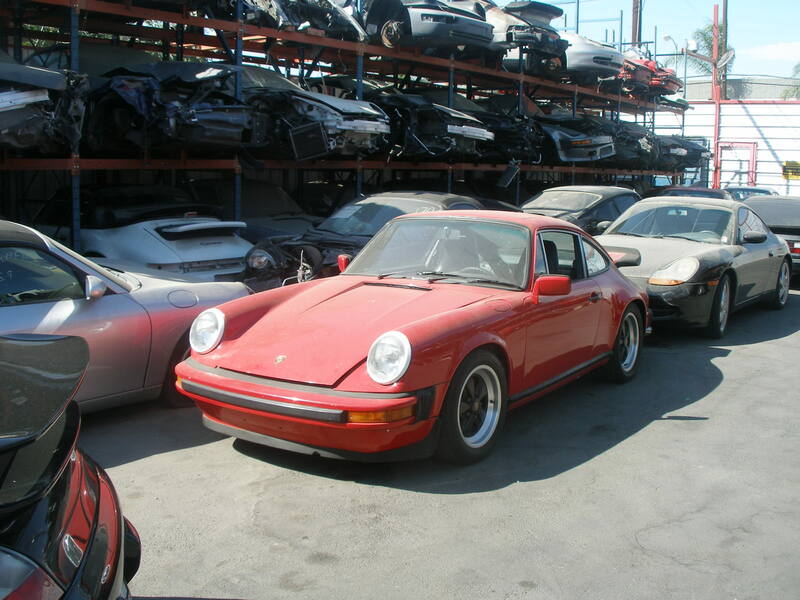 LA Dismantler specializes in late model (1980 and up) Porsches. They sell reconditioned, refurbished, new and used Porsche parts for 911, 930, 964, 993, 996, 986 Boxster, Carrera 2, C2S, C4, C4S, GT, GT2, GT3, RS, RSR, Roadster, Speedster and Turbo; for Coupe, Cabriolet or Targa body styles; 5 or 6 speed, Tiptronic, 2wd or awd transmissions. They have grown to be an international business that sends its parts around the globe and offers customer service in Armenian, Arabic, Turkish, Russian, Farsi, French, Korean, Spanish, Taiwanese, and Mandarin. They are a business that prides itself on being one of the cleanest and most environmentally friendly salvage facilities in the industry. Last Friday I drove up the 210 from my home in Pasadena, hung a left at La Tuna Canyon Rd. (a stretch of curvy pavement that I will most certainly visit in the giveaway Porsche), and dropped in on Sara at L.A. Dismantler who gave me a first hand look at Porsche salvation. Sara was kind enough to let me take some pictures as she gave me a tour of their facilities. 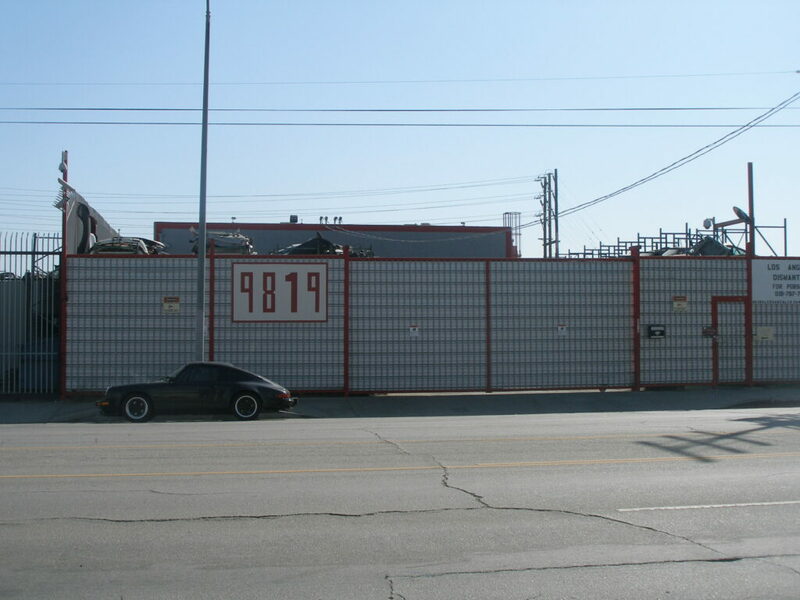 As I passed through the gates and entered into the salvage yard I was greeted by dozens of late model Porsches who were resting peacefully on three story racks in their final stage of life, each with an obvious fatal wound that had led them to this place. Across the yard was a large, super clean, warehouse where the team at L.A. Dismantler went about their daily business of reclaiming flawless parts from less-than-flawless Porsches. As we walked deeper into the warehouse Sara explained to me (a Porsche and Salvage novice) how their business worked. 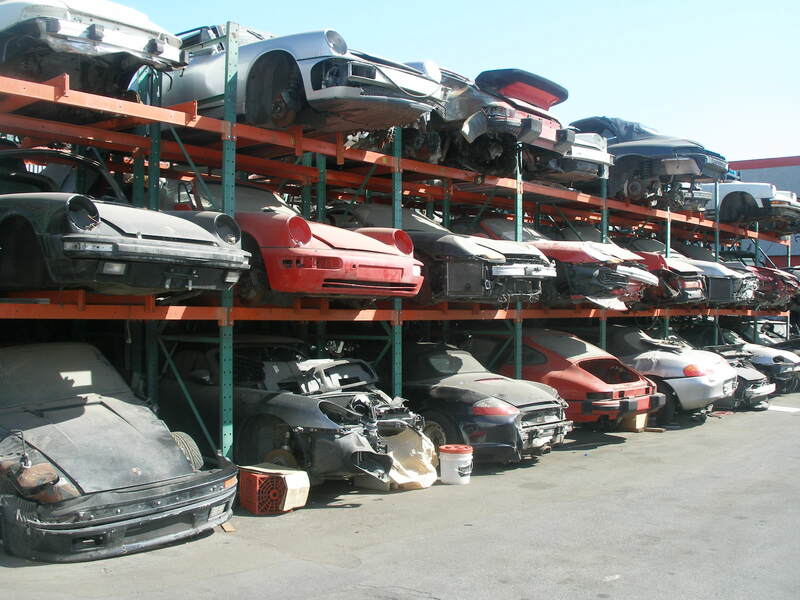 Once the quality parts are removed from the damaged Porsches, they are prepared for sell on L.A Dismantler’s Ebay Site or for direct sale to customers looking for specific parts for their projects. In order to be successful in this type of business, a depth of knowledge is needed with regard to the Porsche brand, the various parts of their machines, and an expertise in being able to identify salvageable parts. These are all things that L.A. Porsche accomplishes with mastery and is the reason they continue to keep a 100% positive feedback rating on their ebay auction site. If I ever need parts for my Porsche 911 Cabriolet (wink wink, once I win it that is), I know where I am going to go. Thanks for the tour Sara!